Just a warning - you don't want to have a mouthful of coffee when you get to the end of my post because I don't want to be responsible for your monitor and keyboard being sprayed! The hat in progress. Using all 100 needles, because that's what I figured I needed for the circumference of the hat. The main colour is grey, as that's what I had most of. One half of the hat incorporated some blue stripes, the other half some green stripes. The plan was to have a 21 inch square piece of knitting. Of course, I didn't measure it straight off the machine because it tends to shrink after coming off the needles. and hey presto, a hat .... er, maybe not, unless it's for Hagrid (a half-giant in Harry Potter, if you don't already know that). Oh well, I thought, I'll wash it and dry it in the dryer and it'll shrink down a bit. Guess what's next! Yup, ripping it all out and doing it over in a much smaller size. 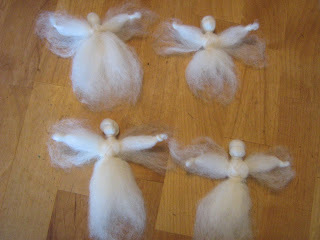 Handmade gifts of wool angels. Yesterday a new friend taught me how to make these little lovelies out of wool roving. They are so simple, yet, so sweet. We have decided to make several and give some as gifts too. The boys each made one and have decided that they really want to try some needle felting now too. I woke earlier than usual this morning, so rather than doze off again I went and made myself a cup of rooibos tea and brought it back to bed with a stack of knitting books. I spent a pleasant hour and a half looking through the books - some from the library, some my own - and also took the opportunity to crochet some ties onto my cushion cover to finish it off. This was a good haul of knitting books from the library, some of which I hadn't seen before. And this is the finished cushion cover, stuffed with my patchwork blanket. 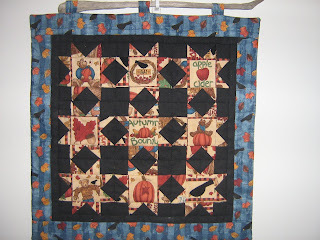 One side I made as a "log cabin" block, which entailed a lot of binding off and rehanging on the machine to complete. I was pleased that the technique worked, as I was making it up as I went along. The other side is just stripes, as I had used up nearly all of the yarn by that time! I think I actually prefer the reverse of the striped square, but by the time the thought occurred to me, I had already starting sewing the squares together. 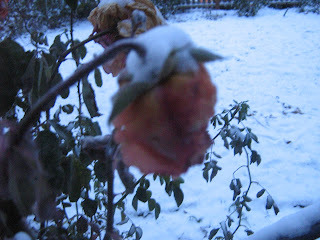 Things haven't been very rosy around here lately. I haven't been feeling very healthy and E has had a bout with a cold and a stomach flu . We have slowed down to a snail's pace waiting to get better and many of our regular activities have fallen by the wayside. On Sunday I forced myself to suggest we resume our usual weekend walk up on the mountain by our house and I am so glad that I did ( as is our dog). It felt so good to be out, in nature, soaking up the sun's rays and enjoying the peace and happiness that I always find when I am out. I spent some time just lying on the ground with the sun shining on me, chatting with S, watching the boys play in the woods, and some time fooling around with the camera. 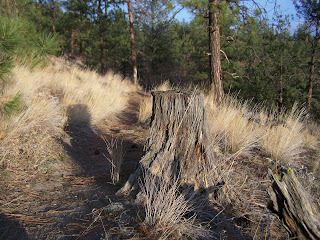 This is one of my favourite little bits of trail. 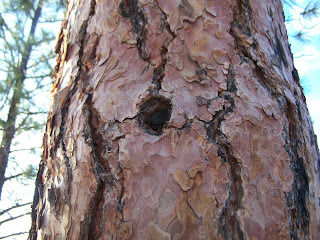 A future home of some little critter? 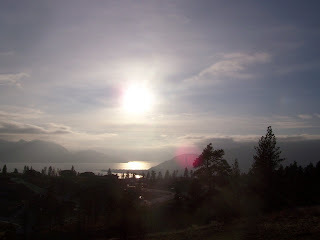 A view of the lake, with long, low rays of winter sun. Two more of my favourite things. 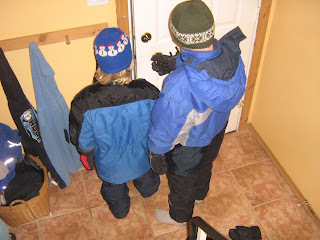 :-) Yesterday things starting looking up around here, health and morale were improving and the boys started getting excited about the forecast of snow. 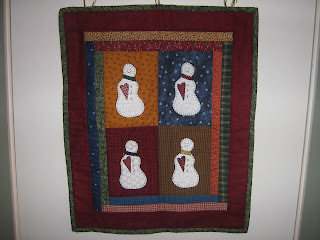 In order to prepare we took down our fall wall hanging that Nicola made for us. And put up this winter one that I found at a thrift store. One of the things I find most frustrating about being sick is not having the energy to cook a proper meal of good food. We have had way more than our share of soup lately (which I do love) and so yesterday evening I was pleased to be feeling well enough to make a proper meal. 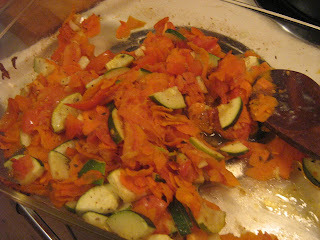 I roasted some shredded carrots, zucchini, garlic, red pepper and some of our tomatoes, that we have stored in the garage, to be used as a polenta topping. This topping was so good that I had to stop myself from eating it all and save some for the polenta. 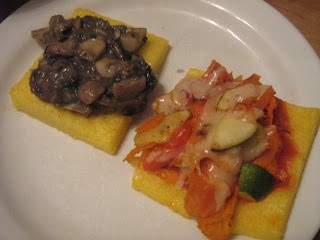 Then I also made a mushroom topping with thyme, so we had polenta two ways. Both were delicious. 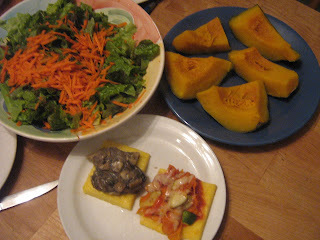 We also had one of our garden squash and a simple salad. It was lovely and, as with many things going on lately, reminded me just how grateful I am for the many wonderful little things in my life that I often take for granted....good health, good food, friends and family. This is a Friday night tradition in our house. Home-made pizza and a wood fire. 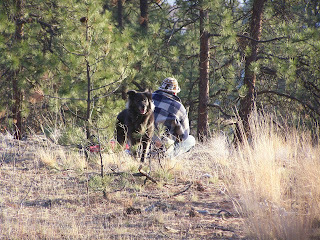 As for Saturday night....well, this is what I was doing this evening. This afternoon our family was treated to a pantomime at the local theatre. We enjoyed Aladdin's story, complete with lots of booing and hissing at the bad guy, thanks to three lovely seniors who are surrogate grandparents to our children. Afterwards we went out for a snack and then it was home for a late supper. My husband didn't like the beer I bought for us to share, so I ended up drinking most of the 750ml bottle! He likes a joke, that one! Above is the "ticket" he wrote out for me for being drunk in charge of a knitting machine! You just HAVE to see these cupcakes. I just found them on an old post at this blog, which I've been reading for a while. They must have taken SO long to make, but they really are brilliant! This is an awesome message from the Hopi. It ties in so closely with what I believe. A whole evening devoted to knitting, chatting and drinking tea. Can't get better than that! Finished the blanket! Four squares by three, each 16 x 16 inches. I crocheted them together, then crocheted around the edge, first with single then double crochet. It's not enough to stop the curling, so I'm going to try washing and machine drying it to soften it up and hopefully flatten things out. And at last, the Harry Potter scarves are done. The green one on the right was the one I made on the machine, the blue one on the left I handknitted and finished last night. They could do with a wash too, especially the blue one, as the stitches need a bit of evening out. I'm thinking of frogging (ripit ripit) the brown lacy shrug and making a plainer version on the machine with some handknitted ribbing. The lacy pattern was pretty, but very bumpy on the back, and being acrylic probably wouldn't flatten out like blocked wool. S and I have been busy. As soon as my 9 year old saw me playing with the knitting machine the day I brought it home, he wanted to play too. Below are the pieces he has made. 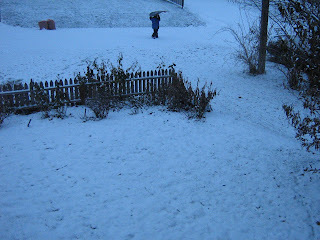 The little scarves and blue bag were made from miscellaneous rectangles he ran up without any pre-planning. The scarves have secret openings in them so he can hide things inside. This is his planned project - a bag to hold the rest of his knitting! Made from Lion Suede (which was a bit of a bugger to knit - it doesn't flow smoothly enough for the machine - actually, it isn't great for handknitting either)! This is a hat I made this morning. I had some Mission Falls Cotton lurking in my oddments box so I thought I'd run up a child's hat. This wasn't ideal yarn for the machine either. No stretch. I had to fix a few stitch formation problems along the way. I knitted a rectangle, about 20 by 9 inches, folded it and sewed up the side seam, then sewed across the top. I added braids to the two corners and they can hang free or be tied together to shape the top of the hat more closely to the head. Don't you think Pooh Bear looks cute? Here's an update and peek at the leaf blocks that I appliqued earlier this month. I managed to get this far and have been dithering over the fabric to use as a backing for this project. Thirteen years ago today, my husband, my two year old son and I emigrated from the little island of Jersey to Canada. According to the Encyclopedia Britannica 2007 Book of the Year, Jersey's total area is 45.6 square miles or 118.2 square kilometres. Compare this to Canada - 3,855,103 square miles or 9,984,670 square kilometres. Population density: Jersey 1,936.4 people per square mile, Canada 9.3 people per square mile (hmmm, you can see why it might feel a little crowded there, eh)! Compare the amount of "passenger cars" - in Jersey, 74,007 (that's almost one for every person, including children); in Canada, 18,123,885 (about one car for every two people). Now who do you think has a problem with "rush hour"?! Jersey has no public debt. Canada had, in 2006, US$585,554,000,000. Jersey has long been known as a "tax haven", with many foreign companies having their headquarters there to reap the tax benefits. Income tax, at least when I was living there, was a flat 20%, though there were many allowances which one could claim. Until this year, there was no sales tax. Canadians, on the other hand, are considered to shoulder a very heavy tax burden. If you were to drive from St John's, Newfoundland, to Whitehorse, Yukon, you would travel 8,298 kilometres. Assuming an average of 60 km an hour, 10 hours a day, it would take you two weeks to get there. You can drive around Jersey in a few hours! They sound very different, don't they? However, they do share certain similarities. Both have Finance and Real Estate at the top of the list as far as Gross Domestic Product is concerned. Both have English and French as their two first languages - in Jersey, Jerriais, a sadly dying language, and in Canada, Quebecois. Both have Queen Elizabeth II as their monarch. Some wonderful things have happened since we moved here. We had two more children. We bought a house with a garden full of trees. We discovered homeschooling. We made some incredible friends. We're glad to be here. So many good books are coming to my attention lately. I so enjoyed this one by Robert Bateman and highly recommend it. It is a nice quick read for those short on free time, but it is packed full of...ooh, just so much good stuff. I hope you will read it. There's a contest happening over here and in addition to sending the winner a prize, Chan will donate to their favourite charity. Just received one of PETA's newsletters and thought I'd slip in a link to this bit of info about the treatment of turkeys. And here is a site which will give you lots of ideas for cruelty-free dishes to make this Thanksgiving. Thought I would post some tempting pictures. These boxes came to my house just now. They are filled with all kinds of goodies. 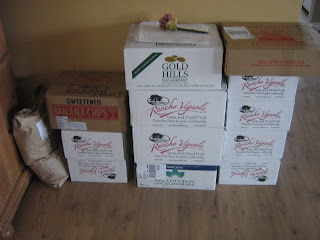 There are dates, almonds, raisins, hemp seeds, flax seeds and more, all purchased online from here and delivered right to my door. Not all of it is for me, we did a group order so some will go to other friends. But these? These are all mine. 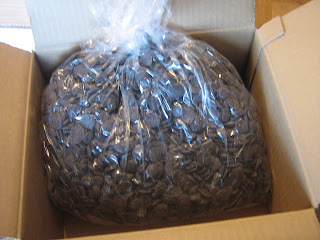 Ten pounds of fair-trade, organic dark chocolate chips. Think it will last long? 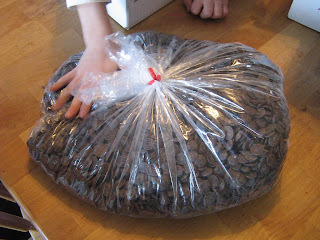 Thought you might like to see this - I saw it yesterday on Susan's blog. You older British folk out there will be familiar with Sooty and Sweep, I'm sure! In these You Tube videos, Sooty, Sweep and Sue have fun knitting and felting. Worth a look. My kids loved it too. Knitting by machine is very different from knitting by hand but both satisfy the knitting craving in one way or another. Did I say craving? Oops, I must be addicted! Machine knitting is fast, even with a basic machine like the Bond. You can whizz through a skein in 15 minutes. It satisfies the need to produce something, finish it up and get on with using/wearing it. The irony is that I am likely to spend more time seaming and finishing off than I am knitting, and I don't really like seaming. 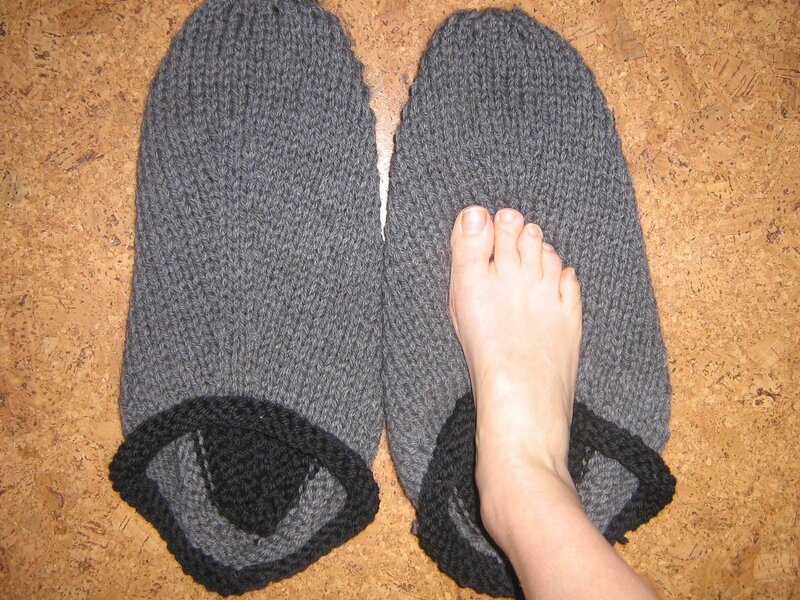 I decided to devote as much time as possible to knitting my blanket today. Of course, there were still other things calling for my attention - I put a couple of loads of laundry in and made bread and dinner for the family, even went out for a short walk in the sun, but apart from that I sat at the dining room table and clacked away on the machine. I had already made three squares for my blanket a few days ago, then life intervened. Today I made eight! Each square is 16 x 16 inches. 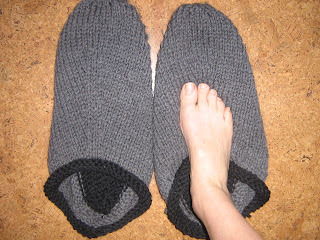 I'm knitting this with various colours of Lion Brand Vanna's Choice (acrylic). One square takes about 80 grams of yarn - each ball is 100 grams. I have 14 balls - one for each square plus two of navy blue which I will use to crochet the squares together and then crochet around the edge of the blanket. The leftovers will be used to make two more stripey squares for a cushion cover for the folded blanket. This title may be familiar to you already, but was new to me. A slim volume of great information to encourage healthy lives and a healthy planet. It does contain resources given to help you find businesses that sell Eco products, but I wouldn't say the resources given are as comprehensive as in other similar books. In my opinion, the strength of this book is in it's approach to making living green positive and attainable in a one-step-at-a-time way. This makes for an encouraging read. I enjoyed seeing the lists of simple steps to help make everyday choices better for personal health and the environment. Simple things like showers (using a filter to remove the chlorine) instead of baths and changing from using harmful chemicals to clean with to simple effective natural ones (think vinegar, baking soda and vegetable based soaps). These may not be new to those already avidly pursuing a greener lifestyle, but the author has made many short lists for "green" choices which encompass other facets of our day to day living. I support his information sharing approach in encouraging people to think about their choices and to know why living green is better for everyone. Each step towards living more consciously really does contribute to helping our planet and all life here. It's a pretty quick read and in my opinion, well worth it. ...which looks like your typical cheesy romance. 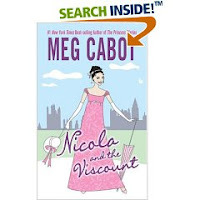 Nicola the orphan wants to marry Lord Sebastian, blah, blah, blah. ...yup, wouldn't mind looking like her, and I'm sure my husband would love it too! I tag Heather, Katherine and Samantha to try this too! I used this design for a retro- shopper style bag before, but this time I added two inset zippered pockets for some organization. The main fabric was from Dinah's giveaway (thanks again Dinah!) a few months back and the lining fabric was from my thrifted stash.